United States Civil Air Patrol Is Established. Dec. 1, 1941. The Civil Air Patrol established. 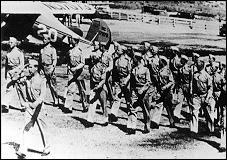 One of the many WWII civilian volunteer groups was the Civil Air Patrol (CAP), officially created on Dec. 1, 1941 under the Office of Civil Defense. During the war, CAP members flew anti sabotage patrol, target towing, border patrol, search and rescue, and anti-submarine coastal patrol missions and also aided in recruiting AAF trainees.